Hallo! My name is Maria and I am the research assistant for the National Alliance of Museums, Health and Wellbeing based at UCL PACE. Funded by Arts Council England, we’ve launched the Alliance so that information about museums and health can be shared and to provide support for those individuals and organisations working in this area of activity. My main role is to map existing practice, literature, reports and evaluation on health & wellbeing activities in the museum sector in the UK. I also carry out research into health and social care structures and identify key contacts for museum people. I am having an amazing time in this role as I get to work on the wider categories of arts, culture and health, which I have been specialising on for the past few years, through clinical and academic work. My object at the Horniman Museum. 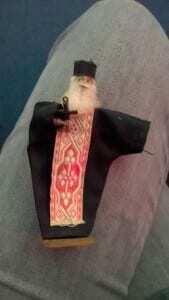 A tiny Greek Orthodox priest. Late September was very exciting for museums and wellbeing. I participated in a Horniman Museum training on the use of museum objects for creativity and learning. While going through the Hands-on Base gallery, I accidentally bumped into a Greek Orthodox priest miniature (Picture 1).